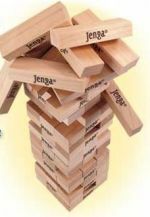 -Another F@CKED Borrower- casualty of the housing bubble: Trillion Dollar game of JENGA!! Trillion Dollar game of JENGA!! This housing bubble is like a game of Jenga. You can see the blocks going higher and higher, you know it is going to fall down soon, but it hasn't yet...and you just hope it isn't on your turn when it does! The housing market is the same way right now. Some people pulled out of the tower, and are content. Some wanted to "win", so they kept taking turns and piling blocks on the top. Some just wanted to stay where they were, but all the people piling on the top forced things like property taxes so high, they were forced to move. BUT, as of right now, the tower is still standing. The "players" are taking more time moving their pieces. Occasionally the ceiling fan rocks the tower and some people yell "it's crashing!" while others look at it and say the fundamentals are fine...it is a strong table, nothing to worry about, keep piling on. So the question is, WHAT IS going to push this thing over the edge? and WHEN is that going to happen. In an earlier post I went over how the ARMs were set to adjust and how I think that will be one catalyst that could finally send the jenga tower falling. Another thing that could shake the markets is if there is a liquidity crisis in the Mortgage Backed Securities (MBS) markets. These are the people the buy the loans which allow the lenders to keep making loans. They are already starting to demand more premium (interest rate) for the risk they are assuming. I think this story from Bloomberg says it all. The title is: Housing Bubble Bursts in the Market for U.S. Mortgage Bonds . I'm not going to paste the article here, and I'm sure some of you read it already over on Ben's blog a few days ago. This thing is really VERY simple. You have 50-80% of borrowers taking ARM mortgages the past few years. These people got loans when rates were crazy low, and lending standards lacked "old school" criterias like verifying income, reserves, penalizing people for BK's, etc. When these people run out of "fixed" time on their ARM and they look to refi again, they are going to find higher rates (yes, still historically low, but not super low like they had been), and much tighter lending standards because of the article above. This combination of higher rates and tightening lending standards (they ARE happening now) is going to leave people with very few feasible options. If they can barely afford their I/O ARM at 50 and 55% DTI's (debt to income ratios), what are they going to do?!?!? I predict that things will be slower and prices will start a slow decline through 2006. Hot properties will still move as will properties that are priced right. 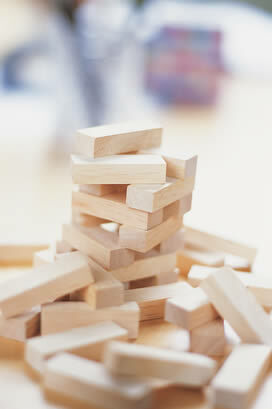 I look to 2007 and 2008 for things to start looking like this: JENGA!!! Between now and then (through 2007), there are about 1.5 trillion dollars of mortgages that will be going adjustible. I'm already seeing the tightening in the MBS markets. I was talking to my manager this week about a loan, and they told me that our investors were demanding a lot, so we could not be lenient with rate and loan exceptions. Very few times the past few years have I ever been told that. The old mantra was "we'll find a way, we'll make the exception", now the mantra is "we're not going to lose money on that loan". Only time will tell...but that is where I have my sites set. What do YOU think?!?!??!? I would like to thank you for your well-reasoned articles on this blog. I think it's great that someone from the mortgage industry is making the effort to share these types of observations. My understanding of the credit bubble currently affecting residential real estate in this country is enhanced by reading the thoughts of an industry insider. Now for the OT part of my post: I lived in San Diego during the insane run-up during 2000-2005. I often thought of buying a place, but always underestimated the staying power of the housing bubble. Back then, I didn't realize it was actually a credit bubbble. I guess I just assumed that somehow everyone else was working at jobs that paid far more than the 60K/yr job that I had. So now I have moved back to Honolulu (where I am originally from), and of course the same nonsense is playing out over here. And I have a similar job making 60K/yr. Here's the question, though: When it comes to Hawaii, there really IS a shortage of real estate, combined with a large influx of tourists from places like California who would appear more more than happy to speculate on local real estate. After all, who doesn't want a vacation home in Hawaii, especially one that appreciates (curently) at 25% per year? Sometimes I am tempted to buy a crappy condo for 350K, which would really stretch me. A decent 1BR would cost $500-$600K and, of course , that would have to be IO ARM (a very bad thing). Are there any ideas out there about the Hawaiian market? I know it's ovrevalued, but I suspect that it's less over-valued than places like LA or SD. What do you think? My sister bought a SFR in 2000. $670k then sold Aug 2005 for $1.6m. Since then nothing in the neighborhood has come close. I just compd at realtor.com and it looks like it would list for 1.3 today. I'd say there's a lot of downside especially if the military continues to hemmorage its' technical and professional officers who make up a sizable portion of the market. 1. Something will spook the MBS market, either a forecast or scandal, that convinces a critical mass of investors that the jig is finally up. 2. There being no way to make money on loans, credit dries up more or less completely, at least at rates that would make affordable housing at current prices. 3. Smart (big) money stays on the sidelines, waiting for further drops. 4. The combination of #2 and #3, possibly with the added insult of tighter lending regulations, reduces demand to near zero very quickly. 5. 50% price drops, minimum, in hot markets, at least 20% nationally owing merely to difficulty and expense of getting mortgages. That's my scenario. I believe the key to the situation is the huge leverage overhang into which most of the big players of the market have gotten themselves. A slowdown guarantees negative cashflow down the road. Further, investors won't sit still for a long, drawn-out decline in the market; when the lights change, they'll make for the exits as one. I could be wrong, but that's how I see it. I have a couple of questions for ya: You're inside the lending biz and I gather that you don't deal directly with the customers, (I think you said in one thread that you deal with brokers, correct?) Still, you might have some insight here... so I'll ask anyway. I'm trying to get a feel for the demographic of the FBs who are making life hell for the handful of us Americans who are still financially responsible. Are they primarily boomers, lost generation, Gen X, Gen Y? And is any particular ethnicity over-represented? The ethnicity thing has become a concern of mine recently, as the bankruptcy laws changed and will turn many defaulted debtors into de-facto indentured servants. I'm concerned that when (not if) the next recession, credit crunch, etc happens and pokes a big hole in this credit bubble, that the effects will fall unequitably on minorities and poor whites - effectively enslaving them to their debt and to their banks. Thanks in advance for any insight you can bring to this. What does this mean to us? Increased offer and decreased demand. Original content such as the Jenga post is what keeps me coming to this blog. I agree with your expectation of market direction and the timing. However, I do not think we will see a collapse with this cycle, just a typical cyclical decline. The collapse will come when the baby boomers die off faster than the younger generation replaces them. The average baby boomer will be about 70 years old in the year 2025. I would not expect the big collapse before then. Pinning your tremulous little hopes on sky high rates and choked off lending, eh? You might as well substitute those with alien abductions and chem trails, boys. What kind of so-called mortgage broker is it that would know so little about the in-coming Fed Chairman? After Q1 or Q2 of '06, rates will be lowered, not raised. As to choking off credit, I'll leave that to you boys to research for yourselves how likely that is. '06 in CA will be yet another in a long line of Bubblehead "deferred successes". I'm pretty sure that the inflation will govern the fed, not mercy towards the speculators. You're deluding yourself if you think the rates are going back down before 2008. Energy prices alone will be enough to prove you wrong. Yea... I too am going to ignore all fundamentals and hang my hopes on what the incomming Fed Chairman might or might not do. Sounds like a winning strategy to me! Actually, “Helicopter Ben” is going to have to keep rates going up--not just to prove his (alleged) bonafides as an “inflation fighter,” but to keep that foreign capital coming to the US. You think interest rates are high now--wait and see what happens when all those overseas holders of US paper dump it because Bernanke turns on the printing press! -oahugh...I FELT the exact same thing!! That everybody else was making more money than I was! I was dumbfounded how "everybody" was buying 300-500k homes. Until I really got into the industry, I had no idea. I don't know enough about the hawaii market to give you any meaningful analysis. -Idaho spud...correct, I only deal with brokers, but I usually know the ethnicity/demographics of the borrowers. To answer your question, everybody is involved. The one thing that DOES concern me is how the use of stated income was "forced" onto many unsuspecting borrowers, and many of those were hispanic. I was reading one blog last night where an immigration attorney was working on 35 cases, and in 34 of them, they owned homes! I'll try and find the link and post it here. I think I read it on MessThatGreenspanMade...but I don't remember for sure. It was a sad story of a hispanic mom making 30k a year and having a 400k mortgage. She had NO idea her payments would change...and didn't believe the attorney. The mortgage and RE people were experts she said...they would not do that to her. If anybody remembers the link, post it here. - zephyrNOT...see the post below yours. even if the new chairman DID lower rates, there is no way he will be able to lower them to a point that will help most people. Besides, inflation will HAVE to be stopped and rates will sit in a more normal 7-9% range. Still relatively low historically, but 3-5 points higher than when many got their loans. Spells trouble. So practice saying it... J E N G A!! Interest rates will not be the cause of the decline. Housing declines do not require higher interest rates. Nor do higher interest rates cause housing declines. The buying by speculators, and real buyers who accelerated their purchase timing have cause temorary surge in demand in the last few years. This demand level is not sustainable. The speculators are selling and the builders have overbuilt. The real buyers who accelerated their purchase timing will not be there to buy . Because of these factors there is a growing inventory of homes for sale. The interest rates are merely icing on the cake. Inflation and interst rates will reach their cyclical peak during the first half of 2006. We should see the beginning of a significant slowdown of the economy and a mild recession by this time next year. Housing prices should decline for about three years, until the natural balance is restored. Do you really think the Fed will go all the way to 7-9%? With an added reactionary risk premium and lower volume necessitating higher margins to cover fixed costs wouldn't that mean 11-15% conventional mortgages? That's a non-starter. Going from 5.75% to 13% doubles the payment about a 40% drop in equivalent sales price. Not 50% because of deductabilty, lower taxes and insurance, etc. But still that 40% is only the drop attributable to equivalent monthly costs and assumes no price correction from the current overheated levels. My conclusion? The Fed cannot push the Fed Funds rate much beyond 6.25%. From 1% to almost surely 4.75% this spring. It would be difficult to convince them to undertake eveh that another 150 basis points rise without a long pause to see the effects of their policy to 4.75%. Let me clarify...I'm speaking more to REAL mortgage rates. I look at my rate sheet from a few weeks and months ago. When looking at the grid of rates...I had lots of full doc "blocks" in the 5's. And lots of stated "blocks in the 6's". NOW, the lowest "starting rate" on my entire rate sheet is around 6.5% for full doc, and about 7.25 for stated. The rates I'm quoting TODAY on full doc, are about the same as STATED rates of a several weeks/months ago. The rates on 2nds are all 10's and 11's now...when it used to be mostly 9's and 10's. Yes, I'm considered a "subprime" lender...but I know that my A-paper counterparts are experiencing the same thing. The FED has been raising rates...but until the past few months, competition between lenders was preventing companies from raising their rates. It has been pretty abrupt the past 2 months. The investors are demanding a LOT more. My whole point about the rates is that they will NOT be in the 4% range again anytime soon (I don't think it's possible). 6% is a "low" rate...but when you HAD a 4-5% rate...that makes a difference...ESPECIALLY on the large loan sizes that we are seeing in the "bubble" markets. I'm seeing bwrs with 900k 1st's and 300k heloc seconds. They are getting KILLED with the heloc payments jumping around! But that is what happens when you buy a 1.2 million dollar home with 0 down. I hope I helped to clarify my position some. Um…just what, then, do you think the effect of rising interest rates will _be_ on all those folks with ARMs, I/O loans, etc., etc.? Their payments will be going up a _lot_, and they could barely afford them in the first place. That was the point of those “creative” loans in the first place! And do you really expect that there will be no effect on the number of such loans written in the future as interest rates rise? "Jenga". That's a great analogy. It would be cool if SoCal or Ben collected these bits of wisdom along with the date they were posted. They will make for fun reading in about 6 months. Iron56, I did not say that there would be no effect from the interest rates. Rising interest rates will cause trouble for people. However, the market decline has already started, and the interest rate pain is yet to cause any distressed selling. Interest rates will be a contributing factor, the icing on the cake. The main event is the slowing of active demand combined with increasing supply. Even if interest rates go down the housing prices will weaken. Supply and demand. Economics 101. Subprime is on the fringe of the market and will be leveraged to the decline. You will have a front row seat for the worst of what is to come. .. And 500 people each day will continue to move to Los Angeles, 400 people each day move to San Diego, and these people will want to BUY BUY BUY... and the weather will remain sublime. But I do agree; it doesn't look great down the road, but in SoCal we do have somewhat of an advantage. You are correct. But you would be surprised by the number of "a-paper" (700+ fico) borrowers getting subprime loans. The higher DTI's, "lax underwriting", and competitive pricing are the main reasons. Subprime is NOT what it used to be. Everybody thinks higher rates and only troubled borrowers. We used to have blocks on our "subprime" rate sheet in the high 4's and low 5's!! Now you tell me that is "subprime" pricing. The entire market has become blended. A-paper is now doing option arms down to 620, 600 and even 575 fico scores. Alt-A is completely blurred, and subprime is doing from 500 to 680+ Fico's. Yes, supply and demand will be the main catalyst...but everything is tied together. Higher rates make it hard for some people to make payments, so they sell. just like people want ferrari's, BMW's, Porsches, Rolex's, etc. BUT you have to be able to AFFORD them. You also have to remember that people are leaving CA as well. It is tough to track down solid stats, especially with the impact coming from south of the border. Let's be honest, you need to be making some decent money to truly AFFORD a 400-500k home! 40-50k a year doesn't cut it in the long run. Interest rates aint gonna get it for you. Lending strangulation aint gonna get it for you. Hoping and blog twitching won't change that. The market is now and will continue to slow down due to precisely the reasons zephyr outlined. If he happens to believe that '06 will bring nominal declines, I disagree with that but only to the extent that I beleive they will come in '07. Oh, maybe 10 to 15% nominal. Over two to three years. Then we'll have another nice bull market. I highly recommend a quick google search for bubblehead predictions going back well over five years. and if you compare the stats from previous slowdowns, you will see this is way off the charts. SoCal has ALWAYS been more expensive, and it will be. People will pay a premium to live here. BUT the loans being made back in the 70's were probably NOTHING like what is going on today. I wasn't a doom and gloom Y2K guy, and I'm not all doom and gloom on housing. If you can put money down, afford a 30year fixed payment (less than 40%dti), plan to live there for a while, and like what you are buying, the GO FOR IT! In the long run, I think it is a good buy. The problem is, that type of borrower is a dying relic. We have 23 olds doing Neg-ams and I/O helocs buying million dollar homes based on 12-24 months of "good" employment and stated income (loan officer). I bet they didn't hand out 1million dollar loans in the 70's with no money down...on stated income, or did they?!?!? I was in diapers, blowing bubbles...not thinking about real estate ones. It was bad then. But not as bad as now. We had negative amortization loans then, and lenders were very liberal about underwriting rules. We also had a very limited system for generating mortgage funds. Wall Street was not in the game then. It was all about banks -- S&Ls really -- they not only dominated the market, they were the market. There was a more limited supply of capital then. Which actually made the market more volatile than today. The downturns were impacted by severe liquidity crunches. socalmtgguy said: "I bet they didn't hand out 1million dollar loans in the 70's with no money down...on stated income, or did they?!?!?" I am with a bank that has very "sensible" lending guidelines, an "A" lender. I am amazed with the types of lending done in the last few years. I still can't believe it. It is the cause of prices running up so high. I sold my investment Real Estate a couple of years ago because I thought by 2003 prices had gone beyond insane here in SoCalif. Frustrated, scared, incredulous.....Of course by now I have very little confidence in my logic and predictive ability. There should be a Jenga: Housing Bubble Special Edition. With pieces marked with market terms. Then when someone crashes the game, you know what was the last straw. I'd purposely lose the game with a "Speculators" piece. If this was in reference to San Diego, the above is immaterial. There aren't any 400-500K SFH's there. "However, the market decline has already started, and the interest rate pain is yet to cause any distressed selling. Interest rates will be a contributing factor, the icing on the cake. The main event is the slowing of active demand combined with increasing supply. Even if interest rates go down the housing prices will weaken. I agree with you Zephyr. I think that what has caused the current demand erosion is the asset price inflation in home prices alone. Basically we're at the tipping point where most people who haven't bought in yet are already priced out, and that is why the slowdown has already begun before the increased interest rate component has really kicked in yet. The turn of a business cycle, definitely Econ 101. However, the size and duration of this bull run fueled by low interest rates is going to make the downside interesting. I don't see armageddon either, but most definitely a marked decline, particlarly in the most over-heated markets. Socalmtgguy is going to have a front row seat for the "really big show!" And I'll see a decent one up here in the Bay Area too. I like your 'Jenga' analogy. I'm kinda partial to the roller-coaster ride analogy. We've had four years of the clink-clink-clink of the chain dragging us up to the top. Common now, it's a new era. This wasn't one of those old fashoned wooden coasters with a slow rise. >20%yoy is not a slow clank clank ascent. This has been one of those modern steel coasters that shoots you to the top of the first curve, then its a very bumpy ride downhill with lots of inversions. yeah where i am originations are down but fundings are up. I have to agree with you that the line btwn prime and subprime is becoming blurred. SoCalmtgguy loved your JENGA analogy about current real estate bubble. Want to know if you can comment on foreclosure process. If a borrower is 90 days late on the mortgage and can't pay due to income, the lender can foreclose. But what if prices in homes are falling fast ~ 25% per year, can the lender foreclose? Let's say the borrower put only 5% down, prices are now 25% less than he paid. Now he is upside down on the mortgage. Lender is nervous, and thinks next year prices will go down another 25%. Can the lender do a pre-emptive foreclosure even if the borrower is making payments? Since there is a high likelyhood the borrower will walk away. If the primary lender can't foreclose, can the HELOC lender? I read somewhere that in California if you are upside down with the original lender and walk away from the property, the lender can't come after you. Since you did give them the collateral by mailing them the keys. But if you refinanced, then the new lender can make you liable for the whole amount of mortgage, regardless of what they sell your home for. So you are stuck with the loan amount regardless. So what is an upside down home owner going to do? He can't move, he can't pay the mortgage, and his house is depreciating? Rent out rooms, start a home business, or disappear and start a new identity? I think once some pricing problems crop up, there will be a crash. Sometimes it hard to believe this whole housing thing came crashing down. Let's play "Should I buy...or wait"
So you like the stories of FB's....eh?!?!? "We'll just have the appraiser push the value..."
Welcome to the gun-show...now show me your ARMs!